Jacal in Big Bend National Park. Southern Arizona's San Xavier del Bac in 1913. Tohono O'odham jacals can be seen in front of the mission, many of which are still used today. Look up jacal in Wiktionary, the free dictionary. 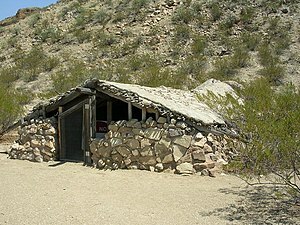 The jacal (həˈkɑːl; Mexican Spanish from Nahuatl xacalli contraction of xamitl calli; literally "hut") is an adobe-style housing structure historically found throughout parts of the southwestern United States and Mexico. This type of structure was employed by some Native people of the Americas prior to European colonization and was later employed by both Hispanic and Anglo settlers in Texas and elsewhere. Typically, a jacal consisted of slim close-set poles tied together and filled out with mud, clay and grasses. More sophisticated structures, such as those constructed by the Anasazi, incorporated adobe bricks—sun-baked mud and sandstone. Sketch of a Jacal from A pictorial history of Texas, from the earliest visits of European adventurers, to A.D. 1879, hosted by the Portal to Texas History. ^ "Texas-Mexican Vernacular Architecture". The Handbook of Texas online. Retrieved 17 Jun 2017. ^ "DeWitt Colony Life". Sons of DeWitt Colony Texas. Retrieved 17 Jun 2017.